I look forward all year to my mom's yearly church rummage sale. I always score so many awesome things! 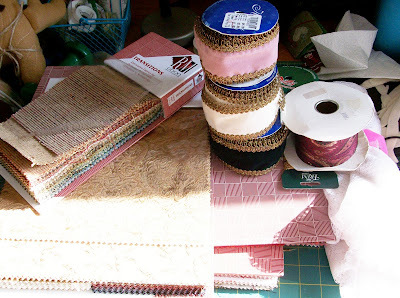 I really have to limit myself to just this event because I am an overboard thrifter! I'm not called packrat for nothing! 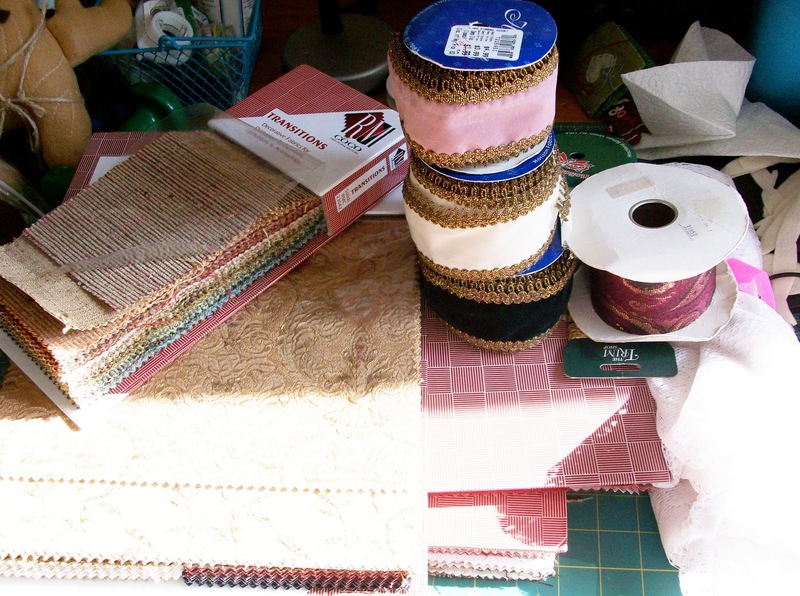 This year I got great trim, fabric swatch books, owls, vintage buttons and a sweet buffet. These fabric books are a great find. I got the 3 big ones for 50 cents each and 2 smaller ones for 25 cents. The trim was in a bag for $1. The white on the right side that is hard to see is lace fabric I scored a yard of for 25 cents! Check out that vintage owl! Is he awesome or what?! Trying to decide if I'll keep him as is or paint him a funky color. The sweet little owl soap dish will remain the the studio as art cause it's so great. 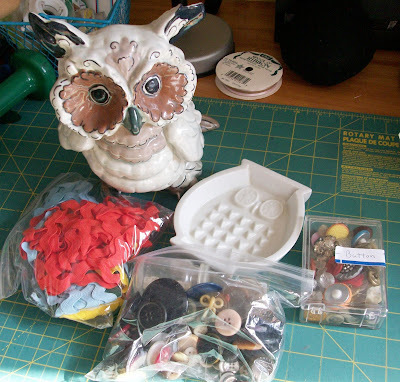 Awesome vintage buttons and some glass ones from the 1930's are in there...squee! Love ric rac and this bag is stuffed full in great colors for only 50 cents I also scored 2 great Cabbage Patch dolls. One is an original from the first mass production and has the features of the original soft dolls...I paid $1!!!!! I have a thing about dolls. I went back on Sunday to see if I missed anything and they were have a "anything you can fit in a brown paper bag for $5 sale. I found more fabric swatches that were all loose so I stuffed it all in a bag and got amazing fabric, silk, suede, tapestry. It's 6 times as much fabric I got the first day. That last great thing I got was a sweet little buffet. Once it's painted it will be adorable. Can't show a photo cause the silly thing is still in the back of the SUV. I can't get it out by myself. Will show pics when I can. Oh well, it looks great in front of the windows! uh, SCORE!!! love when that happens! the owl is amazing. I am sooooooo jealous! I'd love a rummage through those buttons. I'm sure there will be great thing to come from these goodies! I placed a photo of the beautiful owl at the side-bar of my blog! Thanks again for the sweet, sweet candy!! I LOVE it! !